Protect your carpet from everyday life with WeatherTech floor mats. 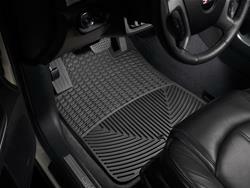 These pliable rubber floor mats from WeatherTech are ready to be stepped on every day. Whether its mud, snow, or rain, these mats will hold what falls off of your feet and keep your carpet out of harm's way. Capable of holding up to 1 1/2 quarts of water in dozens of deep channels, these mats clean up easily due to a protective non-stick finish, and they will not crack, curl, or harden--even in sub-zero temperatures.